K tradeless brewing hike temporary wait and see | Jiangsu Kolod Food Ingredients Co.,Ltd. September 1st began to recover the value added tax policy has been clear, potassium chloride imports and increased production costs has become inevitable, plus this week the renminbi relative to the dollar devaluation, for the entire potassium chloride industry is one disaster after another, according to a rough calculation, the cost of imported K had just signed a big contract or will rise nearly 300 yuan (ton the price, the same below). Current port potassium chloride prices temporarily stable, strong market sentiment, the importer has been suspended shipments, there is a part of traders to finalize the contract, the latter slowly go. Border spot rarely, for reasons of VAT, traders are suspended in advance. 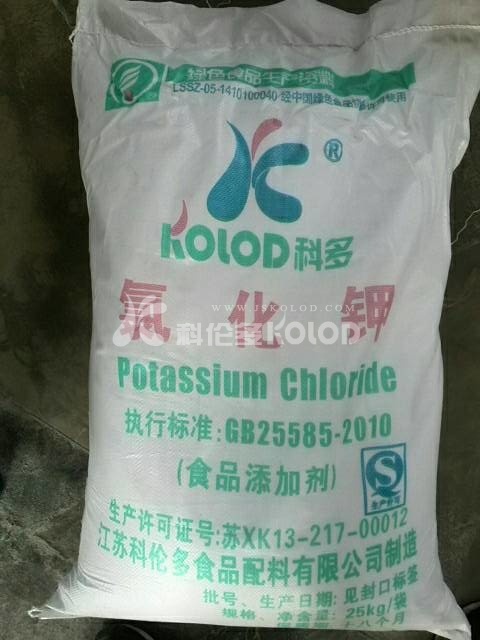 Although part of Qinghai resource-based enterprises production of potassium sulfate potassium chloride potassium chloride, but the overall domestic operating rate is still low, but this also caused the inventory is relatively small, it is understood that many manufacturers for the main fixed agent, other channels not orders; some of the big Saline Lake potash agent has suspended sales, the future is likely to raise prices. In summary, the recent situation in the market for temporary potassium chloride is stable, but the price of the storm is brewing. Potassium sulfate Market is temporarily stable, the price is still vulnerable to run. The 50% North Mannheim process powder factory turnover of more than 2650 yuan, no big change; Sichuan area prices fell slightly, mainstream factory price 2700 yuan; Guangdong individual manufacturers improve factory price to 2900 yuan, but still big talk. And potassium chloride market is different, most of the manufacturers of potassium sulfate actively shipping, in order to try to drive down the inventory before September, the return of funds, for the latter part of the recovery of value-added tax to prepare. Overall, the short term potassium sulfate still maintain low consolidation of the market, after September because of the cost will be significantly increased, the price has become the industry consensus, but the magnitude of how there continue to be observed.